The cacti of the Bodie Hills are not difficult to master. There are only two of them: a Prickly-pear and a club-cholla. Opuntia polyacantha and Grusonia pulchella are both in subfamily Opuntioideae, and Grusonia was formerly included in the mega-genus Opuntia. That large and diverse genus is now treated in Flora North America and the Jepson eFlora as several separate genera. This isn’t just fine-grained splitting; Opuntia is still large, and the other smaller genera are easily distinguished in the field based on the shape of stem segments, overall growth form, and the presence or absence of spine sheaths. 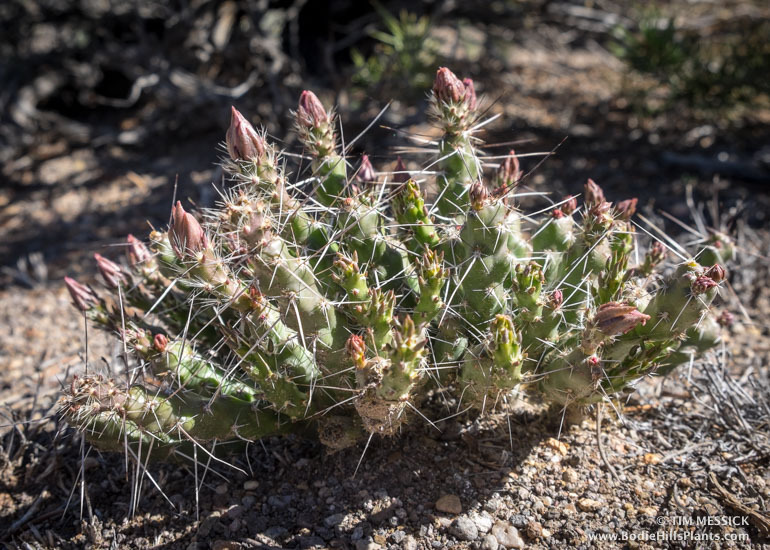 All Opuntioid cacti are armed with two kinds of spines: large, smooth, fixed spines and small, hairlike prickles called glochids, that will easily (and painfully) detach from the plant and penetrate your skin. Opuntia polyacantha (above) is a prickly-pear cactus densely clothed in long spines. Common names include Grizzly bear prickly-pear, Mojave prickly-pear, and Plains prickly-pear, and (probably in Texas and Oklahoma) Panhandle prickly-pear. In the Bodie Hills, it’s fairly common on rocky outcrops, talus slopes, and occasionally among sagebrush. The plants are usually widely scattered, never numerous in one location. This is a very widespread species (in virtually all of the western U.S. and Canada, plus scattered counties as far east as Missouri). There are several varieties. O. p. var. erinacea is the one commonly encountered throughout the Bodie Hills and across the Great Basin, Colorado Plateau, and Mojave Desert. One collection in 1945 (UC733179: Roxana S. Ferris and Laura Lorraine, 11027) from the New York Hill area—part of Masonic Mountain—was identified as O. p. var. hystricina. This could be accurate, but ought to be checked in the field. Var. hystricina (“Porcupine prickly-pear“) occurs mostly in southern Utah and nearby areas of adjoining states. 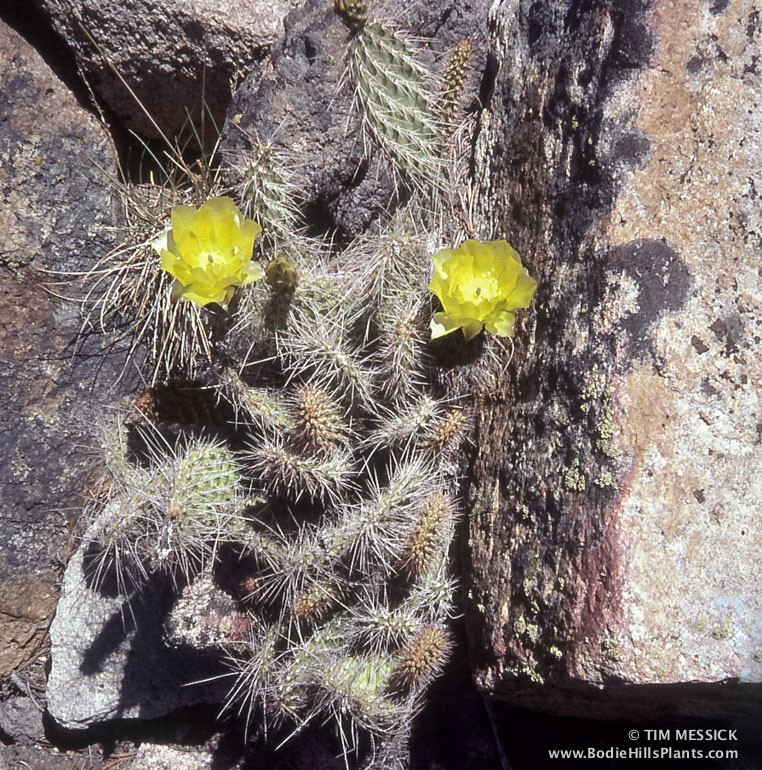 Grusonia pulchella (above) is a club-cholla that also has long spines, but generally less dense than in the Opuntia. Common names include Beautiful club-cholla and Sagebruch cholla. This plant “differs from other North American Opuntioid cacti in having a geophytic habit, where above-ground growth dies back to the crown in adverse conditions, and resprouts under more favorable conditions.” Here are some other photos of it, in flower. Grusonia pulchella is found through much of the Great Basin, mostly in Nevada and Western Utah. In California it is recorded only from Deep Springs Valley in Inyo County. In the Bodie Hills, all occurrences are probably in Nevada. Copyright © Tim Messick 2015. All rights reserved.